Excellent tower with a nice fan. The RGB implementation on the tower is stunning. The fan is adequately quiet, and keeps my Ryzen 7 1700 cool even on a modest OC. My main gripe is the seemingly excessive cable length for the RGB cables. I could lop off ~6 inches of cable and be happier. My mobo's RGB header was 3" away and I had over a foot of cable to manage. Ugh. Other users may not be concerned with this, so if you're good at cable management ignore that point. I strongly recommend this CPU cooler for RGB builds that want budget air cooling. This cooler looks amazing. It's sleek and clean with cool RGB lighting built into the heatsink. The RGB fan looks clean as well. Keeps my Ryzen 5 1600X pretty cool even with overclocks at 4 GHz, with temps under stress test in AIDA64 in the high 60's, which is very respectable considering this cooler is on the thinner side. Keeps my Ryzen 7 1700 cool running at 3.9ghz, the RGB looks great and it runs pretty quietly. The i5-8400 comes with a stock cooler, but looks were very important to me so I just went on the forums and asked, what's a great looking cpu cooler at a reasonable price point? Looks great in my build and runs nice and cool. Only complaint is lack of rgb controlling with the controller. I initially had purchased a fractal design celsius 24 but returned it because the threads of the base of the valve on the radiator were damaged. I purchased this cooler impulsively and I do not regret it at all. It looks pretty epic and if you have an RGB MOBO you can sync the LED on the cooler to match. The fan scared me to install because it felt like the clip was literally a paper clip unfolded but It holds on surprisingly well. It also is universal for mounting and comes with two sets of CPU cooler mounting brackets. Does not come with pre-applied thermal paste so I recommend snagging a tube when you purchase this! It also fits nicely in my case but I had read several reviews saying their case was not wide enough to fit it in and install the side panel-so keep a heads up on that if you're planning on buying this. 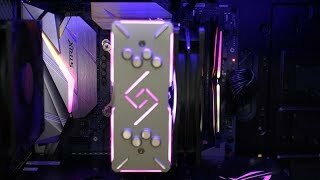 Love the Gammax GT, Cooler and RGB looks great and it's decent for the price ($54 usually, not $119.99) keeps the 8600k cool, and will probably work with a mild OC without issues... I like that it works with Gigabyte Fusion and syncs with the motherboard lighting. Looks amazing, quiet, RGB IS AURA SYNC, keeps a 8600K nice and cool even under mild OC or full turbo on all cores. It cools my CPU at 49 C, very good. It’s underrated and more people should consider this CPU cooler. I was skeptical at first, but decided to take a risk and it works well. The software is good too. Super quiet and kept my CPU cool (+ RGB lighting is super pretty). Really love the RGB on this CPU fan. I am not overclocking my i7 yet, so this keeps my CPU very cool for the time being and looks really cool doing it! Would definitely recommend this CPU cooler.